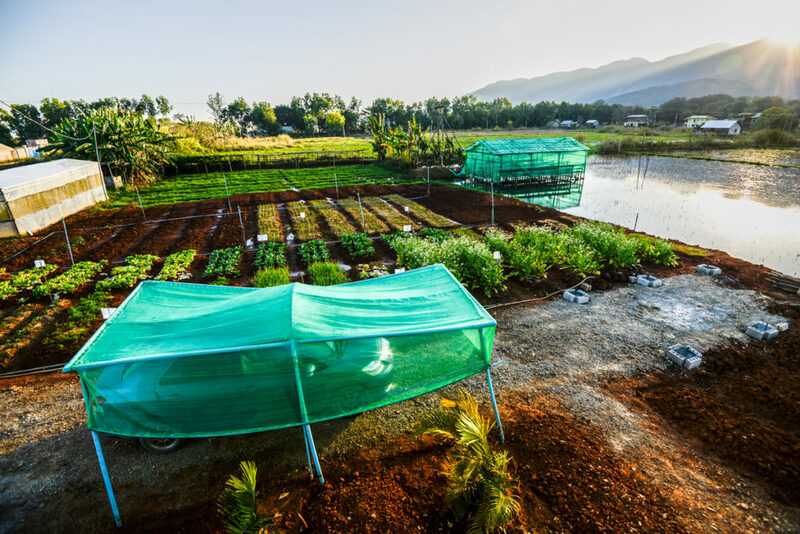 In Myanmar, I visited several projects linked to organic agriculture. I was glad to see that there are many initiatives on this topic and people are really engaged in promoting it across the country. I believe Myanmar is in a very good position to avoid some of the mistakes that other countries in South-East Asia have done. 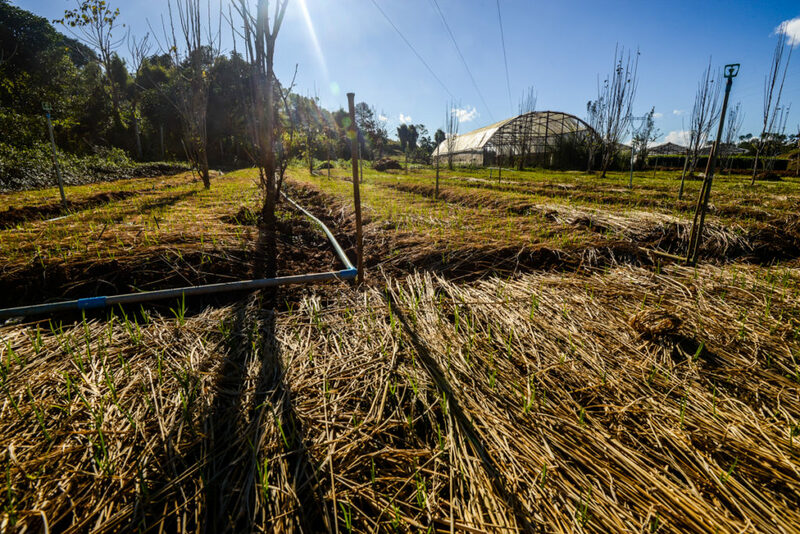 I would love to see a strong commitment from the private and public sector in organic agriculture. This only can be achieved through education and the creation of a strong community of farmers. 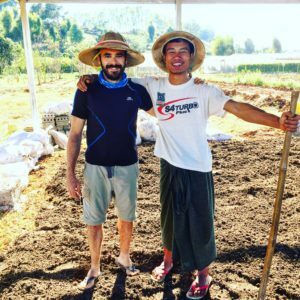 In January 2018 I visited the guys from Golden Ground and Future Organic Farm. 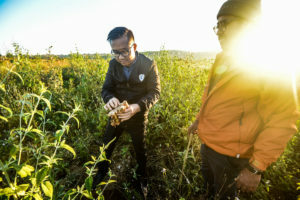 Two initiatives that strive to encourage conventional farmers to switch from conventional practices to organic ones and to spread organic agriculture (techniques and understanding) across Myanmar. I had a chance to visit both projects and spend some time with them. 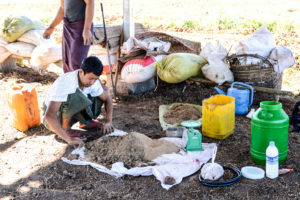 With the guys from Golden Ground I helped to plant onions, potatoes, garlic… and I was also involved in making Bokashi compost with my mentor Hpone. I also suggested producing their own EM (Effective microorganisms) with 3 types of bacteria from milk, yeast, and manure. So we bought all the ingredients and we did it! Golden Ground is doing an excellent job in training farmers in the region close to Aung Ban, Myanmar. When I visited the project, they were building a plant that will be devoted to washing ginger as it’s one of the most important crops cultivated by the farmers in that region. Close to the beautiful area of Inle Lake I met Aung Moe Hein who is running a project called Future Organic Farm. It’s small farm where Aung, Khin Myat Noe, and Aye Aye Aung carry out tests and research studies that are shared with farmers later on. Aung is always on the road. 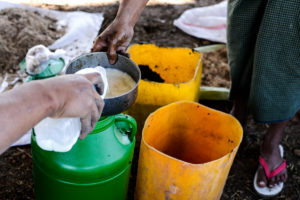 He travels across Myanmar delivering training in organic agriculture and he also explains the risks of conventional practices (chemicals use, soil destruction, loss of biodiversity, pollution…). His job and commitment are remarkable. We exchanged ideas and I really enjoyed our discussions. 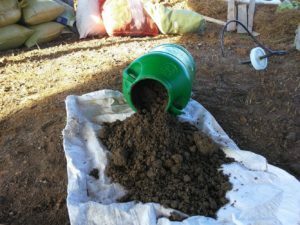 At the bottom of this post, you can find some “recipes” for pest control in organic farming that Aung is using quite often with very good results. First, we smash the garlic, chili, ginger, neem, and tobacco together with the soap. You can spray the plants within 24 hours. 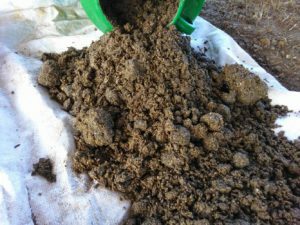 There are 3 types of microbial life that come together to form the mixture. Allow the mixture to ferment in a container with a wide opening and a tight lid. 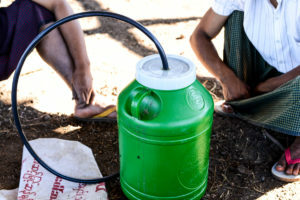 To release pressure in the anaerobic conditions created in the container, make a hole (1cm diameter) in the lid and then squeeze a hose into it. The other end of the hose is placed in a bottle of water. You should see the air bubbles coming out of the water in the bottle. After 5 / 7 days, there are no more bubbles coming out the hose. That’s the sign that the mixture is ready. When you open it, it should smell like bread, beer and wine. If it went wrong it will smell really bad. You can use the mixture right away, but if you want to keep it and use it by bit you need first to sun dry it. Spread the mixture into a thin layer to dry, turning it frequently. Once dried it can be stored and used for a whole year. Make a liquid formula by mixing in proportions of 1 part of mixture to 20 parts of water and 0.5 parts of molasses. After 24 hours it’s ready to use. The liquid should be used within 2 weeks. You can spray it on your veggies and it will be absorbed through the leaves. Spray on a meadow and your animals can benefit from it as well.